How Did We Get Into This Mess? : Medicalizing Presidential Candidates, past and present. Medicalizing Presidential Candidates, past and present. 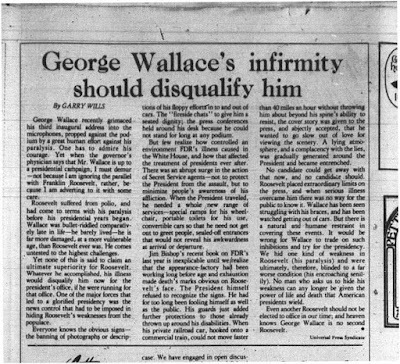 Erik Loomis over at Lawyers, Guns, and Money recently emailed me this pdf of a 1975 article in which Garry Wills, the famous author, argued that George Wallace should be disqualified from running for president due to his "infirmity." [Update: The great Rick Perlstein gave me the link to the Google News archive of the column, which is more readable]. Wills goes into a lot of detail about FDRs last years, arguing that respect for the president's physical disabilities was leveraged by the White House to conceal his rapidly declining mental facility. Wallace, having been "seen struggling with his braces," might similarly use his physical disability to conceal mental unfitness, argues Wills. 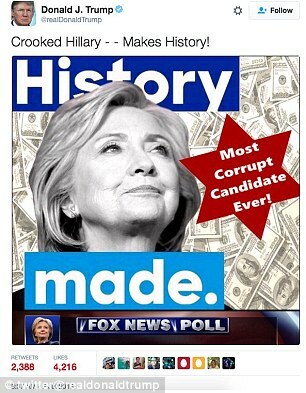 No candidate could get away with this now, and no candidate should. Roosevelt placed extraordinary limits on the press, and one serious illness overcame and there was no way for the public to know it. Wallace has been seen struggling with his braces, and has been watched getting out of cars. But there is a natural inhumane restraint in covering these events. It would be wrong for Wallace to trade on such inhibitions and try for the presidency. We his one kind of weakness and Roosevelt (his paralysis) and/or ultimately, therefore, blinded to a far worse condition (his encroaching senility). No man who asked us to hide his weakness can any longer be given the power of life and death that American presidents wield. Even another Roosevelt should not be elected to office in our time; and heaven knows George Wallace is no second Roosevelt. 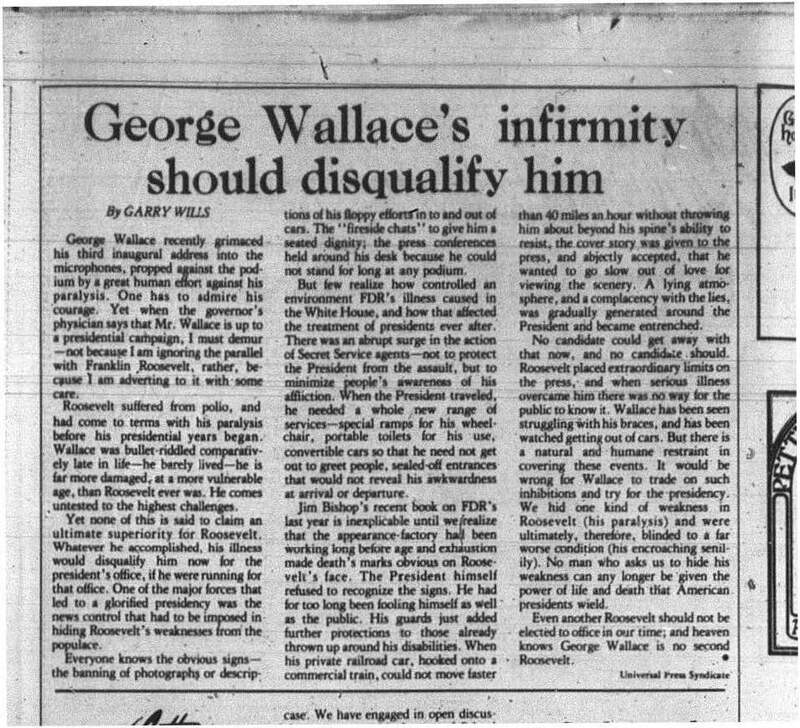 I'm no George Wallace fan, and of course 1975 was a long time ago, but this article was written only three years after Thomas Eagleton was denied the VP pick because it was revealed he sought treatment for depression. Image: Photo of a newspaper article. Sadly, I do not have an accessible version. The context for this is the drive to medicalize Trump's behavior. The other day I wrote some opening thoughts, along with a storify, on the casual pathologization of Trump's objectionable behavior. It's had an afterlife to which I'll link below. My general thought - we do not need to armchair diagnose Trump to beat him. Leveraging disability stigma to defeat Trump is, at the least, a morally complex choice. I'd like people to think hard before doing it. I won't be doing it myself. 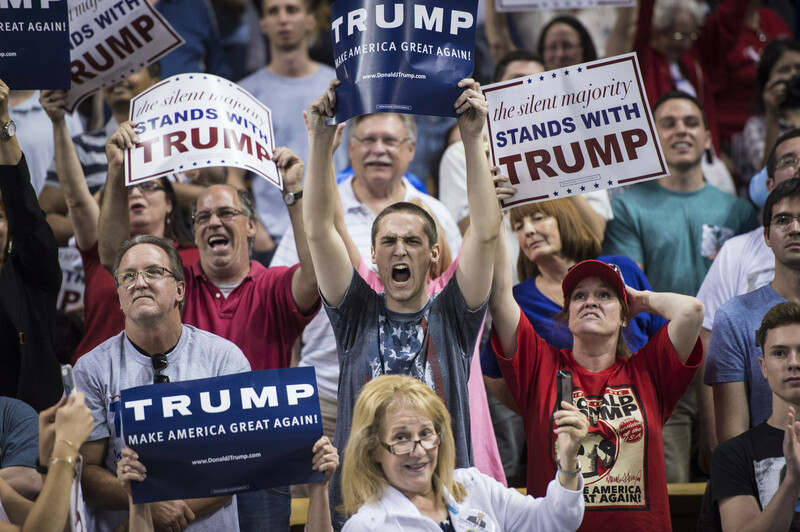 Trump’s disgusting plans are not the result of a mental illness; they’re the result of deep-set, unbridled bigotry that he’s exploiting to worm his way into the White House. So, sure, being erratic and lying a lot could be a sign of mental health needs, but that doesn’t mean it’s the reason for things like Trump being a bigot. I’d like to make the point that people with mental health needs are people with many varying viewpoints on the world – so if a person with mental health needs is a bigot, I would argue that the mental health needs are most often a coincidence. I know people with mental health needs who have done less than pleasant things – even, perhaps, said hurtful things about groups of people – in the middle of any sort of episode. I have had episodes where I’ve said less than stellar things, though I don’t think I’ve ever said bigoted things because of an episode – but I think it’s too easy to write Trump off as being a delusional, pathologically lying narcissist. Keith Olbermann made a 20 minute video applying a psychopathy test to Donald Trump. 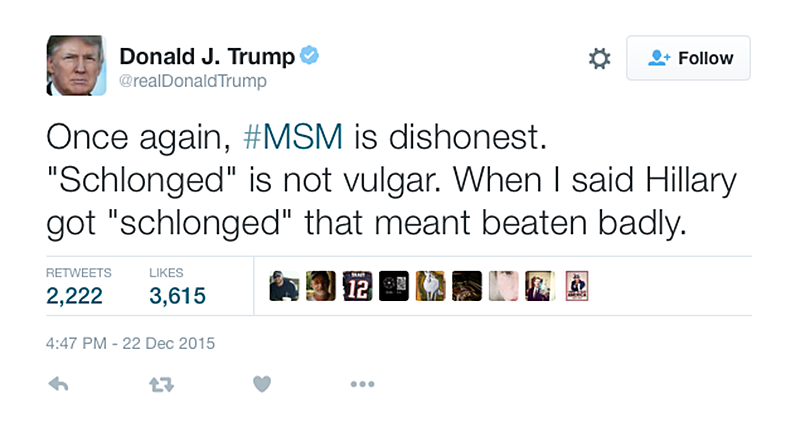 Olbermann did pay lip service to whether doing so was ok but rationalized it thusly “Trump started it” which is true. Trump has applied stigmatizing mental health language to many of his political opponents. The problem with this justification beyond it’s childishness is that it forgets that pathologizing Trump doesn’t just impact Donald Trump. It also has implications on a broader level to how discourse around mental health stigmatizes people with mental illness. People who haven’t been armchair diagnosed by a public just seeking to discredit a candidate that they dislike. I want to steer clear of “medicalizing” discussion of Trump’s fantasies, his microscopically thin skin, his seemingly uncontrollable outbursts. I have no idea whether we’re seeing his basic personality and temperament, or something else. And from a civic perspective, it doesn’t matter. 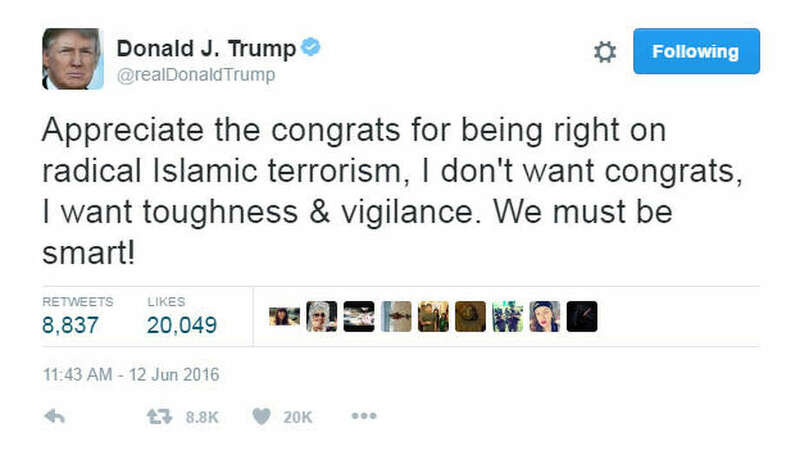 Either he doesn’t know the difference between truth and falsehood, or he knows it and does not care. Either is a big problem in a president. “He’s a liar, he’s a bigot, he makes bad decisions, he’s erratic and unpredictable. That’s what we need to know. Do we need to then extend a diagnosis to go along with that, to make it really objectionable?” Perry said. Abraham Lincoln lived with depression. Each of Richard Nixon and John F. Kennedy took a cocktail of anxiety medication. Aides to Lyndon B. Johnson, who experienced severe mood swings, were so concerned about his mental state that they consulted psychiatrists. Discussions about Trump’s traits are necessary but should be subject to limitations. We should openly talk about the gaps, behaviors and issues like projection and traits associated with narcissism, without diagnosing. The Big Five personality trait/five-factor model framework that McAdams used in his Atlantic piece is one way to engage in this conversation without stigmatizing. It facilitates speculation about how a Trump presidency might look based on his apparent openness to experience, conscientiousness, extraversion, agreeableness and neuroticism without slapping a mental health label on him. We can use specific terms about his personality (disagreeable) and temperament (toddler-ish) but not make attributions to a clinical disorder. All of this is doable even as we still dig into why anyoneaccepts this kind of behavior from a grown man, much less a man who is the GOP’s candidate for president. If we don’t turn inward and examine ourselves for the social factors that feed the bloated ego of someone like Trump, we aren’t doing much better than Trump. If we default to an easy, unexamined “he’s crazy,” we exemplify precisely some of the factors that fuel his popularity. Linking mental illness and an inability to govern is unnecessary, and history clearly shows that one does not inevitably lead to the other. Such speculation represents a facile refusal to grapple with our own social responsibility. For me, I'm listening to Kit, Finn, and Kim. I believe we can defeat Trump without leveraging ableism to our cause. I am as loath to use ableism as I would be to use sexism (vs, say, Palin) or racism (vs, say, Carson). We can do better. We must do better.